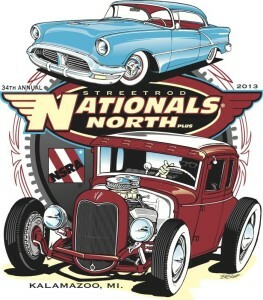 For one weekend in September, the streets of Kalamazoo will be filled with over 2,500 street rods, muscle cars, customs and speciality vehicles from across the country as we welcome the 2013 NSRA Street Rod National North Plus back to town. WHAT: 34th annual Street Rod Nationals North Plus, the region's largest street rod, muscle car and custom car show. FEATURES: More than 2,500 street rods, muscle cars, customs and speciality vehicles from all over the country, each one at least 30 years old or older. These vintage cars feature lots of chrome, gorgeous paint jobs and most include modern safety and comfort features including disc brakes, air conditioning, tilt steering, cruise control and more. A variety of cars will be in attendance with values ranging from $10,000 to $35,000 with a combined value of over $70 million dollars in attendance. ACTIVITIES: Cars will be on display for public viewing throughout the day, while entered into a variety events including Streets of Rods, 29 Below Rodders, Pro's Picks, and NSRA Safety Inspections. There are plenty of activities for all ages and interests and features a "Women's World" section displaying arts and crafts from area artisans, a trade show featuring over 125 manufacturers and dealers of speciality automotive equipment and a Vintage Parts Swap Meet offering used and/or old original automotive parts for sale. Special live entertainment, Sunday rodders worship service, good food and family fun round out the weekend. SHOW HOURS: Friday 8:00 am – 5:00 pm, Saturday 8:00 am – 5:00 pm and Sunday 8:30 am – 2:00 pm. ADMISSION PRICES: $14 per adult, $5 per child (6-12 years) and children 5 years and under FREE when accompanied by an adult. Senior citizens (60 years & older) with proper ID. Military personnel with proper ID. NSRA members with current membership card. Tickets on sale at Kalamazoo County Expo Center only during the event. PRODUCER: The NSRA Street Rod Nationals North PLUS is produced by the National Street Rod Association, the "fun with cars" sanctioning organization, with membership worldwide. REGISTRATION: To register for the show click here. GROUND MAP: To see the layout of the show click here.